CARLO MAROCHETTI and CAMILLE MAROCHETTI Autograph letter Signed. Sir Carlo 'Charles' Marochetti and Lady Camille Marochetti nee de Maussion (1816-1893). Italian born sculptor and his French wife. ALsS. 4pp. No Place. May 5th 1862. 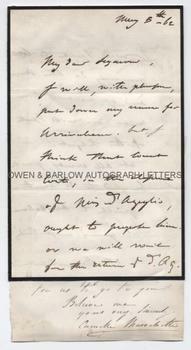 To [Henry] Seyour and Lady [Louisa] Rawlinson. The 3pp letter of Carlo Marochetti addressed to "My Dear Seymour" reads "I will with pleasure put down my name for Arrivabene, but I think that Count Corti, in the . . . of Dr Agrylis [?] ought to propose him, or we will wait for the return of Dr. Ag. I will speak to Corti, you may do the same and as we will soon meet, we will speak on the subject! At all events, I will be glad to do something agreeable to Arrivabene if I can. Yours very truly, Marochettii" to which he adds a postscript: "Thanks to your kind mother and father we have given a good name to my statue! . . . [name of the statue undeciphered]". 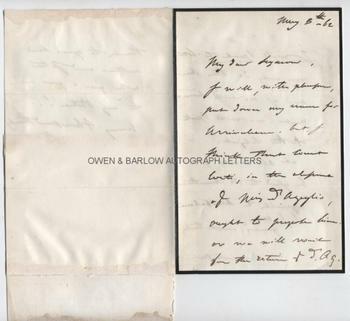 Affixed to the last leaf of Carlo Marochetti's letter is a ALS (1p) from his wife Camille, addressed to Lady Rawlinson, no place, no date, reading: "We are very sorry not to be able to accept your kind invitation for Tuesday next. My husband has, very long ago, taken the engagement of going to Strathfield Saye on that day, if it had not been so, it should have been a very great pleasure for us to go to you." 8vo. Approx 7 x 4.5 inches. Slight mounting marks to top and tail of last leaf. The letter of Camille Marochetti tipped by top edge to the last leaf of Carlo Marochetti's letter has been trimmed at head and has slight browning to foot. Both letters are else near fine. Carlo Marochetti (name often Anglicised to 'Charles Marochetti) was arguably the most celebrated sculptor working in England in the 19th century. He is certainly responsible for many of the most instantly recognisable of London's civic statues, which include those of Queen Victoria, Richard I (displayed at the Great Exhibition and now before the Houses of Parliament), Robert Stephenson (in the forecourt of Euston Station), Victoria and Albert (in the Royal mausoleum at Frogmore), Thackeray (in Westminster Abbey) and the Duke of WELLINGTON (at Strathfield Saye). With Landseer, Carlo Marochetti was also responsible for the bronze lions at the foot of Nelson's Column in Trafalgar Square, which were cast in his own foundry. 'Arrivabene' is almost certainly the Lombard Count Carlo Arrivabene, an Italian patriot and supporter of Garibaldi, who had fought in the Sardinian campaigns of 1848-9 and was later exiled to England. Carlo Marochetti had been an enthusiastic supporter of Garibaldi but, it is said, his patriotic enthusiasm waned somewhat after the marriage to his French wife and on account of the Royal patronage which he enjoyed in England. 'Count Corti' is presumable the Italian diplomat Count Lodovico Corti, who was Secretary of the Italian Legation in London. The addresses are probably Henry Seymour of Knoyle, Wilts and his daughter Louisa Caroline Harcourt Seymour, who later married Maj-Gen. Sir Henry Creswicke Rawlinson. 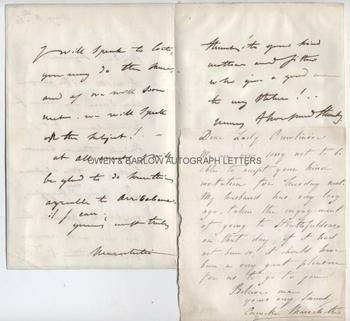 The letters are from a 19th century album complied by Maj-Gen. Sir Henry Creswicke Rawlinson and his wife, Lady Louisa Rawlinson, nee Seymour. Sir Henry Rawlinson was a British soldier, diplomat, orientalist and traveller, who has been called "the father of Assyriology".